I recently had the privilege to teach alongside my senior pastor, Jim Miller, at The Gathering of the Fellowship and ECO: a denominational conference in Orlando, Florida. Kingdom. Study effective steps to building systems that produce the results you want. It was exciting to be at a national gathering of church leaders who made a public pledge to baptize more people than they bury over the next few years – something that few denominations can actually say in 2013. As mainline denominations continue to die, it’s encouraging to see churches rally around the call to make disciples (who make disciples) and who are trying to do so through innovation and strategic planning. It was a blessing to be a part of this gathering. It’s been a while since I read a book as quickly as I read The Eric Trap. But, here’s the thing, I care about Eric Newman. Having not read the book, you might be wondering who Eric Newman is and why I care about him. 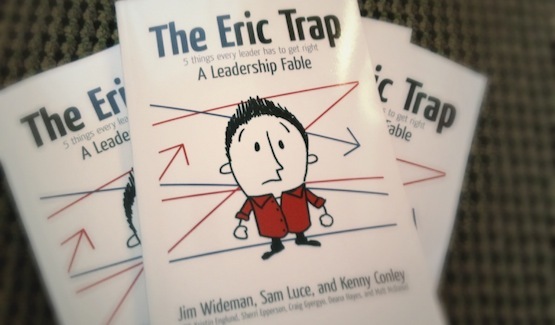 The Eric Trap, a book written as a collaborative effort by Jim Wideman, Sam Luce & Kenny Conley, is told as a fable of sorts that walks the reader through a week in the life of Eric Newman, Children’s Pastor at New Hope Community Church. Eric is your typical kids’ pastor and is a character I could quickly relate to. As Eric faces the typical challenges those of us in ministry face each week (disgruntled volunteers, painful meetings, time away from our family, etc), it’s easy to see a little bit of ourselves in his thoughts and reactions. Which leads me to the things I dig. Not only is The Eric Trap a fable about a guy you learn to relate to, but it offers advice throughout for how those of us in children’s ministry can avoid the mistakes and situations that seem to drag Eric down. I love a good story, but I’m also someone who really appreciates tangible next steps – The Eric Trap is able to pull off both, which I wasn’t expecting and was pleasantly surprised to discover. The writing style of the book makes this an easy read and something I could pass off to a friend or intern without feeling like I’m asking them to read an encyclopedia. Before I pass it off to them, however, I’m handing it over to my wife – with permission to call me out on areas where I’m falling into the Eric Trap. I’d encourage others in ministry to do the same. My one concern about this book is how a female reader will relate to the narrative. In children’s ministry, I recognize that most people who hold my position are women – and most people who should read this book are those who are in children’s ministry. Having said that, I think that every lesson learned is one that applies to both men and women. My concern, though, is whether or not a female reader will relate to Eric in the same way that I do. I now have another book that will serve as mandatory reading for my staff and for those who volunteer on our team and may one day be called to professional ministry. This book is the best of it’s kind. I appreciate that it was developed by those who are serving in real-life, full time ministry. The stories within it are relatable because they happen every week in the lives of those who serve in children’s ministry. If you have a chance to get your hands on a copy, or you’re looking for a book to add to your wish list, this is a book worth asking for. Want to get your hands on a copy for free? For reviewing this book, I’ve been given a copy that I can give away to a lucky reader of this blog! All you have to do is comment on this post (by next Wednesday, 4/18) and tell me your favorite book on leadership and/or children’s ministry. I’m always looking to expand my library – and so should you! I’ll then randomly choose one commenter below who will receive a FREE copy of The Eric Trap.